He said it better than I just did, and I thought it was quite witty at the time. But walking back to the caravan, I wracked my brain trying to think of some way that you could play Space Invaders on paper. I’d blown 10 pence on 1 game, which lasted about a minute before I lost all 3 of my lives. I think that 1 minute was also enough time to give me a cramp in my hand from trying to operate the left and right buttons. When they introduced the joystick in place of the buttons, it was far less painful! But how come the rougher kids always had money to play them? And get good at them too? As I said, if I actually had 10 pence, it’d go into the machine and about a minute later—or sooner—it’d be game over. It must have taken serious cash to build up the skills. Asteroids and Tank Commander (or whatever) were the most frustrating—and briefest ones. Maybe I should have mugged old ladies or stolen the other kids’ lunch money, and got really good at them. Sorry, I’m being lighthearted during this sombre part of the story. It’s just that the Tannoy thing in Luke’s « COKPIT looks rather old fashioned and out of place – don’t you think? The seventies was already over by the time I drew this. But, do you think it’s Charlie or a Burger King employee? Video games on paper? You betcha! In fact, the primary reason I failed ‘O’ level chemistry was because I spent all the time in the lab playing a Tron Lightcycle game I had invented with my mate, Jon. It was truly addictive, and ruined my chances of becoming a forensic scientist (hence art school). Enough about me – the page is poignant, moving and fairly well drawn. So I am ignoring it. 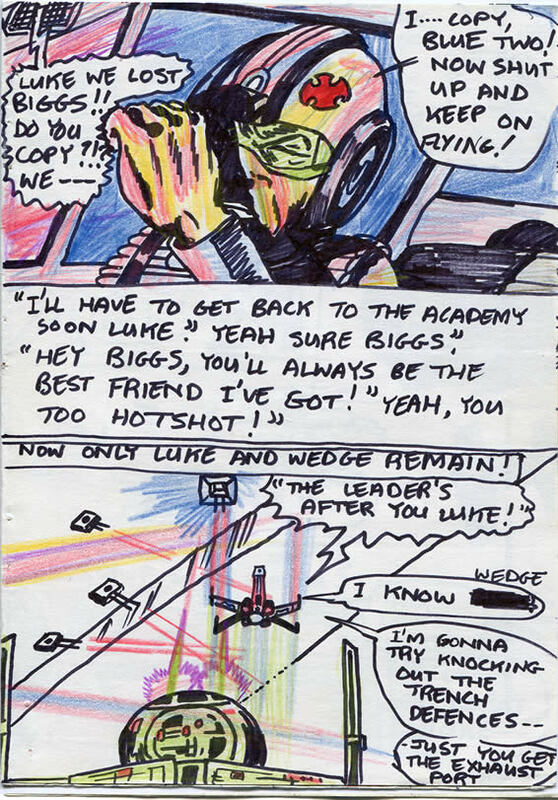 Re: the disappointingly good page – don’t you think the flash-back dialogue in the middle is truly cringe-making? C’mon. Give me THAT at least. How goes the chess Game? Ha ha – good one Tom. The Dejarik game? Well Johnny plays by his own rules (sounds like a movie trailer) and he LOVES it. I love just being with him when he’s enjoying it. At some point I hope to read and comprehend the rules.